YANGON, Myanmar (CNN) -- A verdict expected Friday in the closely watched subversion trial of Myanmar opposition leader Aung San Suu Kyi has been delayed until August 11, said a diplomatic source attending the proceedings. The reason for the delay was not immediately clear, but the new date falls immediately after an important anniversary. Opposition activists mark the anniversary every year of the August 8, 1988, national uprising for democracy, also dubbed "8888." A subsequent military coup quashed the demonstrations, during which Suu Kyi emerged as the face of democracy in Myanmar. Suu Kyi, now 64, and two of her housekeepers are being tried on charges stemming from a May 3 incident in which American John William Yettaw allegedly swam across a lake to her home and stayed for two days. If convicted, Suu Kyi, a Nobel Peace Prize laureate, could face up to five years in prison. Suu Kyi walked into the court unrestricted and unaccompanied by guards, the source said. She appeared relaxed in court, even smiling. She thanked foreign diplomats -- from the European Union and Australia -- for their presence and asked them to relay gratitude to their respective governments for their support. After the delay was announced, she joked to the diplomats: "Sorry you've been given more work," the source said. All defendants were expected to be at the court with their lawyers for the verdicts -- first for Suu Kyi, then for the other three on trial. A Washington, D.C.-based lawyer, who is one of the attorneys defending Suu Kyi, said Myanmar's government was calculating in announcing the delay. "It is in some ways a smart move -- push off the verdict until the middle of August, when numerous government and U.N. officials around the world will be on vacation," lawyer Jared Genser said. "But it remains to be seen whether this ploy will work or if anticipation will be heightened in the run-up to the issuance of the verdict." Suu Kyi's high-profile trial has earned Myanmar widespread international condemnation. On a trip to Thailand earlier this month, U.S. Secretary of State Hillary Clinton made a plea for Suu Kyi's release. And U.S. President Barack Obama has called her detention "arbitrary" and "unjustified." Suu Kyi was put on trial after Myanmar's ruling junta said Yettaw's presence in the closely guarded home violated the terms of Suu Kyi's house arrest. The government rarely allows her visitors, and foreigners are not allowed overnight stays in local households without government permission. 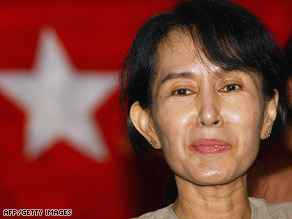 Suu Kyi said she doesn't know Yettaw, didn't know of his plans and denies any wrongdoing. She is charged with subversion.